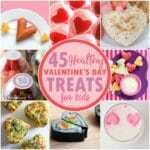 Love making holiday treats but hate the focus on candy and sugar-filled snacks? These 35 healthy Christmas treats are kid pleasers that you can feel good serving this holiday season! I love celebrating the holiday season with my kids. A snowy afternoon filled with holiday movies and special Christmas snacks is my idea of heaven! Unfortunately, the fun holiday treat ideas I find online or in magazines are sugar filled, processed treats. I love my kids to have fun but want to focus on healthy snacking so we can enjoy parties and a few sugary treats without going overboard! 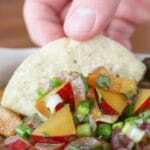 Bright colored of fruits and vegetables are the perfect ingredients for creating holiday snacks. With a few basic ingredients and little creativity you can prepare Christmas treats that thrill and delight kiddos without refined sugar. These 35 kid-pleasing ideas come from some of the most creative bloggers online. They are fun, nutritious, and delicious so you can be the parent who provides the best healthy Christmas treats. 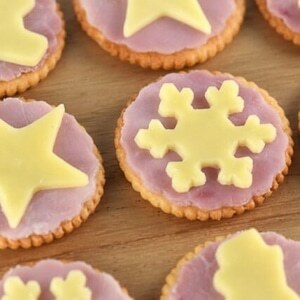 These tasty treats are easy to assemble and could not be any cuter! 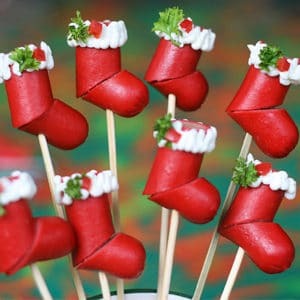 They are perfect for a school party, a lunch box, after school snack, Christmas breakfast or even a fun holiday dinner. 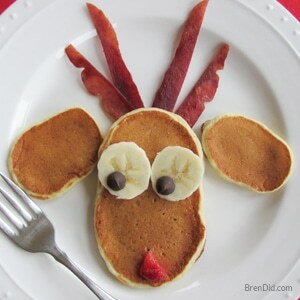 Reindeer Pancakes with Turkey Bacon by Bren Did – This easy recipe turns pancakes into Santa's favorite transportation! Make easy turkey bacon in the oven to make this breakfast low in fat. 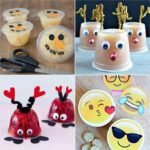 Easy Snowmen Fruit Cups by Bren Did – Turn fruit cups into adorable snowmen with this easy tutorial. 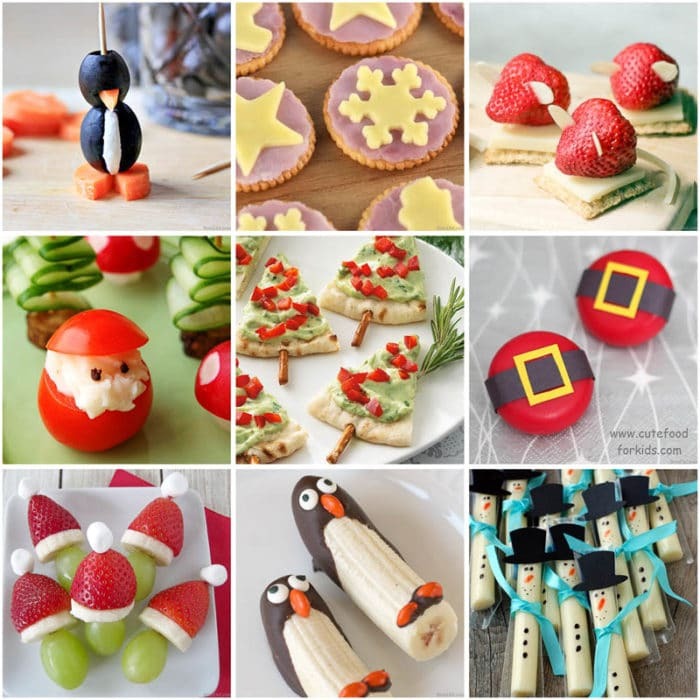 These fun snowmen are perfect for a winter class party or lunch box treat. Strawberry and Cheese Mice by Babble – Twas the night before Christmas and all through the house not a creature was stirring not even a mouse! 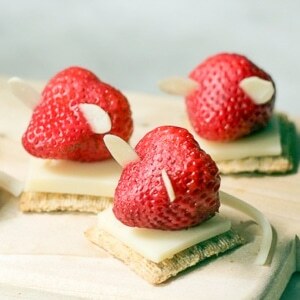 Turn a fresh strawberry into an adorable mouse with slivered almond ears and a cheese tail. 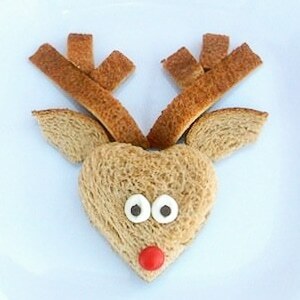 Rudolph the Red Noses Sandwich by Little Nummies – Lunchtime is the perfect time for a holiday treat! This fun sandwich recipe from Little Nummies is easy to make and will impress even the pickiest kids. 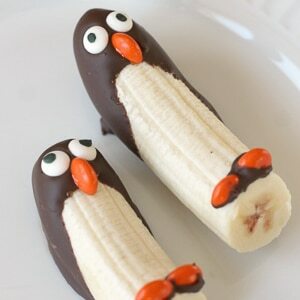 Banana Pop Penguins by Reading Confetti – Kids love chocolate-covered frozen bananas! This dressed up version from Reading Confetti makes the perfect penguin shaped dessert. 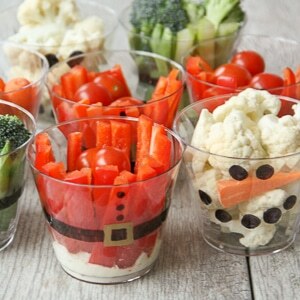 Festive Vegetable Cups by My Mommy Style – It takes just a clear plastic cup and a permanent maker to turn vegetables into a winter wonderland treat. Get the pattern and directions from My Mommy Style. 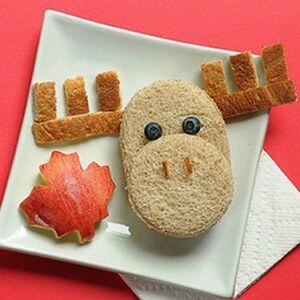 Merry Chris-Moose by Lush Home – This fun moose sandwich was designed for for Canada Day but it also makes the perfect holiday treat. Get the directions from Lush Home. Ho Ho Hot Dog Stockings by The Peach Kitchen – Turn hot dogs or turkey sausage into Christmas decor for your favorite kids. This creative recipe from The Peach Kitchen is adorable! 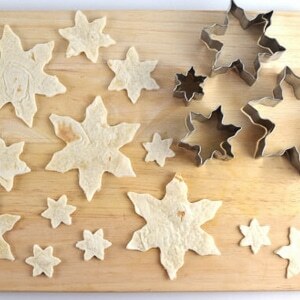 Simply Tortilla Snowflakes by Eats Amazing – Transform flour tortillas into snowflake chips with a just a cookies cutter! Get all the details from Eats Amazing. 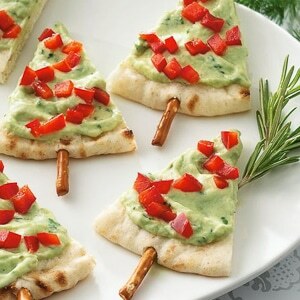 Perfectly Trimmed Pita Trees by Betty Crocker– Decorate a Christmas tree for a fun holiday appetizer made with guacamole and vegetables. Get the easy recipe from Betty Crocker. 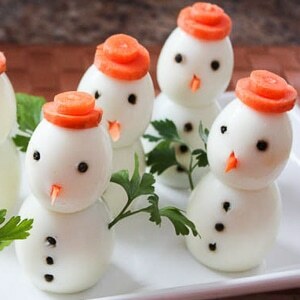 Frosty the Egg Snowmen by Roxy's Kitchen – Turn hard boiled eggs into high protein snacks. These cute snowmen from Roxy's Kitchen even have tiny carrot top hats! 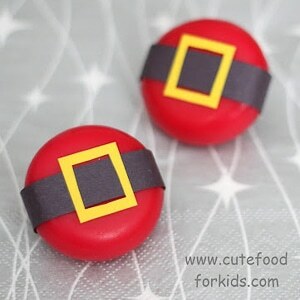 Santa Babybel Cheese Snacks by Cute Food for Kids – Babybel mini cheeses are decked out in their Christmas best! Get the tutorial from Cute Food for Kids . 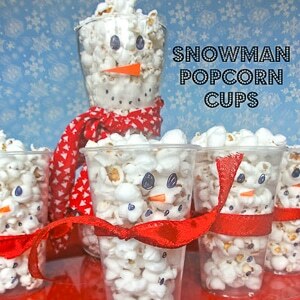 Snowman Popcorn Cups by Creative Kid Snacks – Freshly popped popcorn is the star of this snack recipe. 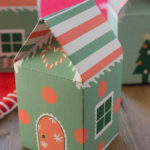 Get the easy tutorial using ribbon and a marker from Creative Kid Snacks. 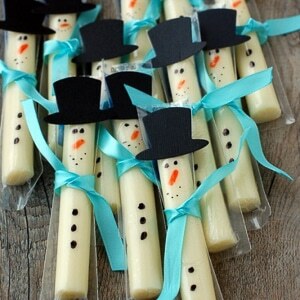 String Cheese Snowmen by No Biggie -This holiday snack is cute and portable! 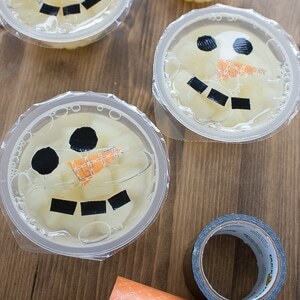 Pack these fun snowmen from No Biggie in a sack lunch or deliver them to a holiday party for kids. 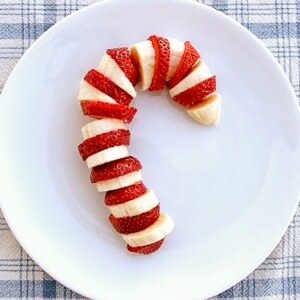 Fruity Candy Canes by Nourishing Minimalism – This strawberry banana treat from Nourishing Minimalism is easy to make and will impress your favorite elf. 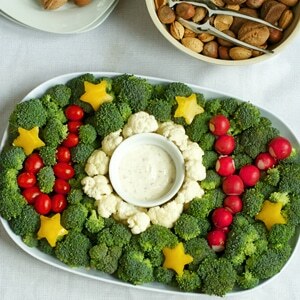 Very Veggie Christmas Tray by Modern Parents Messy Kids – Bring JOY to any party with this creative vegetable tray from Modern Parents Messy Kids. It's perfect for a holiday parties. 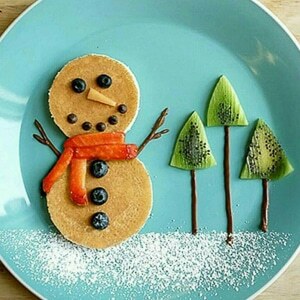 Snowy Man Pancakes by Van's Foods – This pancake creation will bring a smile to any face! Get more fun breakfast ideas from Van's Foods. 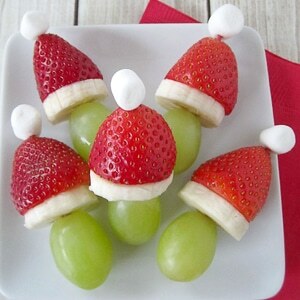 Grape Grinch Kabobs by Momables – These easy grape, banana, and strawberry kabobs from Momables are topped with a mini marshmallow for just a touch of sweet. They're perfect for a kids' winter party. 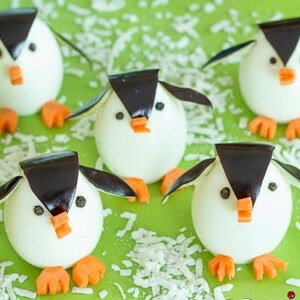 Vegetable & Egg Penguins by Roxy's Kitchen – These adorable penguins are dressed for breakfast, lunch, or dinner! Grab some hard boiled eggs and get the easy recipe from Roxy's Kitchen. Tasty Banana Santas by Clean and Scentsible – You can write Santa a letter while enjoying these cute banana pops from Clean and Scentsible. They're the perfect snack for kids! 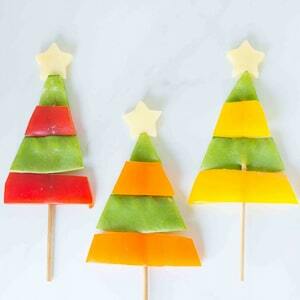 Crispy Vegetable Trees by One Handed Cooks – These fun vegetable trees from One Handed Cooks are the perfect party appetizer and also look festive stuck into the top of a salad or sandwich. 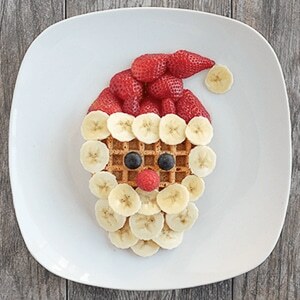 Santa Claus Waffles by Van's Foods – This easy breakfast option is dressed up like Santa with a few banana slices and strawberries. It's the perfect quick meal from Van's Foods. 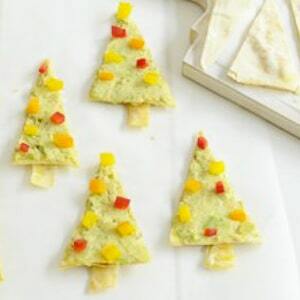 Cheesy Christmas Tree Triangles by One Handed Cooks – These delicious tortilla bites One Handed Cooks make a fun party appetizer or dinner treat. 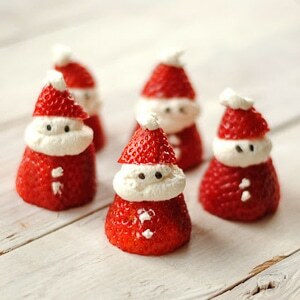 Santa Hat Strawberries by Leanne Bakes – Sweet strawberry and cream Santa's from Leanne Bakes are almost too cute to eat! Use whipped coconut cream to make the treat vegan. 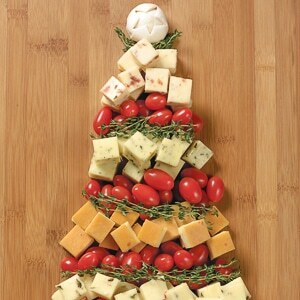 Trimmed Tree Appetizer Board by Cabot Cheese– Thrill your guest with a holiday tree made from cheese herbs and tomatoes. Get the recipe from Cabot Cheese. 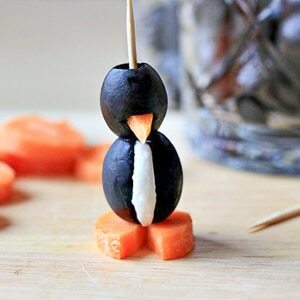 Perfect Penguin Olives by Zoom Yummy – You'll smile each time you see these adorable cream cheese and olive penguins. 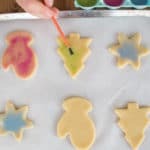 Get the easy tutorial from Zoom Yummy and check out the whole tray of penguins! 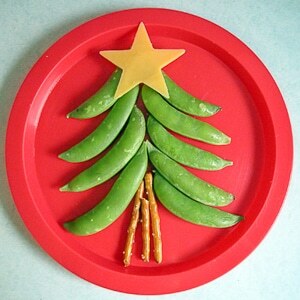 Sugar Snap Christmas Tree by Little Nummies – Whip up this tasty vegetable tree for a cute and healthy snack time treat. Ge the recipe from Little Nummies. 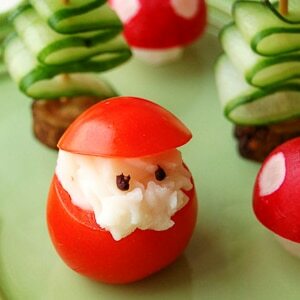 Tomato and Cheese Santa by Ameba– Hollow out a cherry tomato to create this cheese stuffed Santa from Ameba. 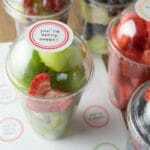 Check out all the fun snack ideas on this Japanese blogging site. Watermelon and Yogurt Trees by One Handed Cooks – Watermelon isn't just for summer. 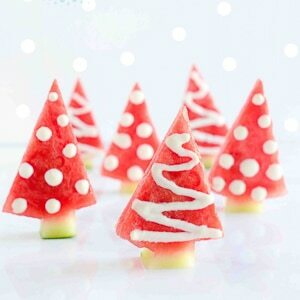 Slice melon then decorate it with yogurt in this easy Christmas tutorial from One Handed Cooks. 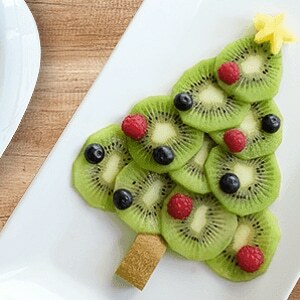 Oh Kiwi Tree by Van's Foods – This fun kiwi and berry creation is perfect for breakfast or dessert. Get all the fun breakfast ideas from Van's Foods. 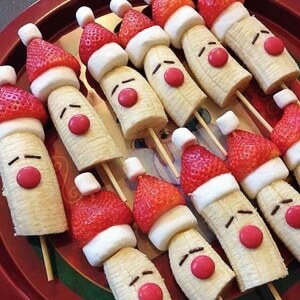 Banana Snowmen Kabobs by One Handed Cooks – Finger food never looked this cute! 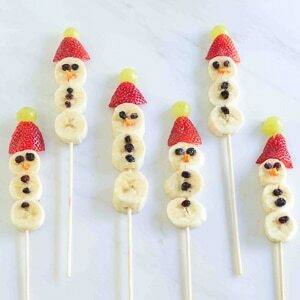 These silly snowmen from One Handed Cooks are the perfect after school snack for little kids. 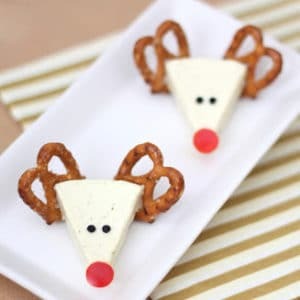 Cheese Wedge Reindeer by Cute Food for Kids – Laughing Cow cheese wedges and pretzels form the perfect reindeer for Christmas snacks. Cute Food for Kids even gave him a shiny nose made from a bit of red pepper. 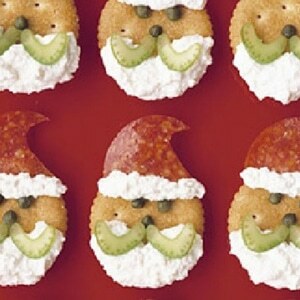 Santa Claus Crackers by Martha Stewart – Kids love making these pepperoni and ricotta cracker appetizers from Martha Stewart. Try making this Italian inspired treat for your next party. 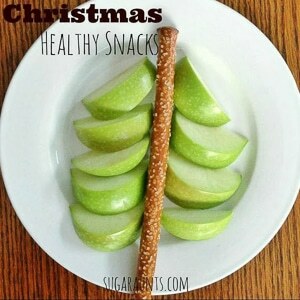 I hope you enjoy making these creative and healthy Christmas treats for kids! 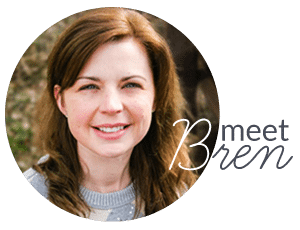 Bren I love your creative and healthy Christmas snacks for kids. 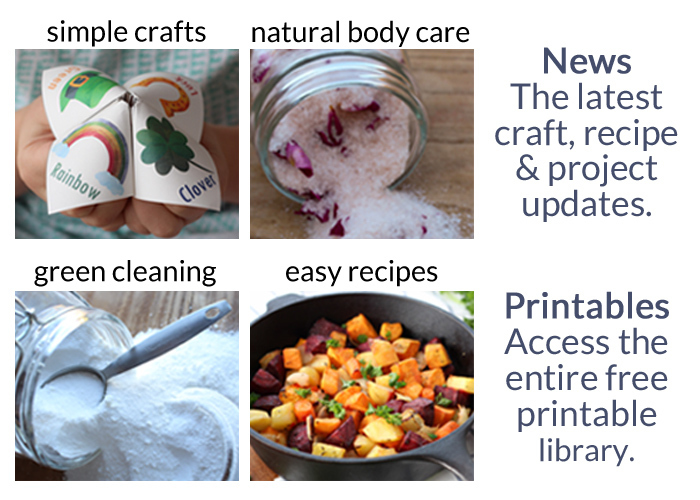 I have just subscribed and am wondering whether you could send these ideas to my email address as I do not have a printer. I am so hoping you can and a huge thank you if this is possible. MERRY CHRISTMAS! Shirley, did you want a list of the ideas?